Barbara Garrison has illustrated many children's books, including The Frog House, One-Room School, Look at the Moon, and Only One. Her illustrations have been included in several exhibitions, and as a professional printmaker, her etchings, collographs, and monotypes are represented in numerous public and private collections worldwide. 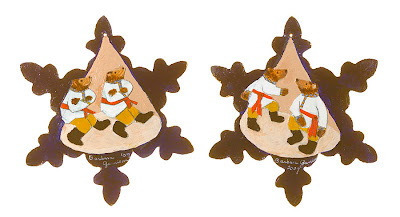 Her book Another Celebrated Dancing Bear -- one of the New York Times' Ten Best Illustrated Children's Books for 1991 -- inspired her snowflake, "Max and Boris Dancing for You!" It will be auctioned off in the first set of snowflakes from November 19-23. Go here to bid, and Jen Robinson should have the entire list of Week 3 artists shortly (Week 2 is here if you missed them). Once again: FIGHT CANCER! BUY SNOWFLAKES!